B.S. from Virginia Polytechnic Institute. M.S.E. from Purdue University. Additional studies at George Washington University. 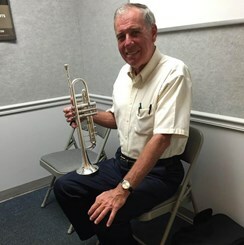 Performance experience includes principal trumpet for the National Medical Symphony, McLean Symphony, Reston Chamber Orchestra, and soloist for Williamsburg Consort, Liberty Classic, Sousa, and Windjammer National Music Festivals.